Pots of different sizes and two big wooden spoons at about 8, then a few years later the trumpet (didn't like it), snare drum (didn't like the teacher, although I should have stayed with it) at about 12. Then at 15 I got a set of 1977 Courtly drum's (jet Black) and every thing fell into place, at 16, my first Les Paul "copy" guitar (a Black Beauty). Later in life I also played a lot on coffee cans with the plastic lids until the lids finally disintegrated. I was just too poor at that time to even think about owning a set of drums. 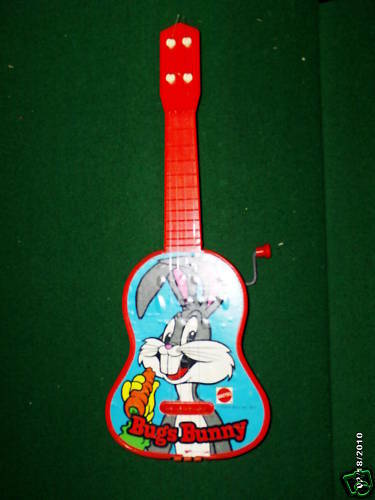 a toy "Bugs Bunny" guitar. One of these days though, I'm going to learn to play the piano. I want to play Us and Them. I still play them all - I prefer drums but each holds something special to me. I was trained as a dancer for many years and we were taught that our body is our instrument and our movement is our medium, so my body was my first and primary instrument. I studied piano too so that's another important instrument for me. Piano at 9 years of age. Not by choice but I am gratefull I did it because it helps you learn music helps with other instruments. I wish I had one still. Only play guitar now. If I had a young child starting out, I would start him on piano first. It will give him a good foundation. I agree. Piano gave me a good foundation and taught me to read music. I still play and when my children were learning other instruments (including voice) I could pick up a piece of sheet music and give them an idea of how a song should sound. This just triggered a memory: when I was a toddler I received a little toy piano one Christmas. Man. That would look so badass duckwalking across the stage with that thing. That is one of the most adorable things I have ever seen in my life! So cute!!! Thanks for posting this sam! And may I add, I love watching Bugs Bunny eventhough I am 22 years old! Well, my first instrument was this Casio keyboard (I think it was a CK80 model). My mom bought it for me when I was 12! Still have it! 1st musical instrument? It was an acoustic guitar that my father bought to me when I was maybe 12/13 years old. But my father didn't have the patience to wait me finding a teacher and he sold it a few months later. So, I had to start working in order to save some money to buy my 1st drum kit.